Herbaceous perennial native to Europe. 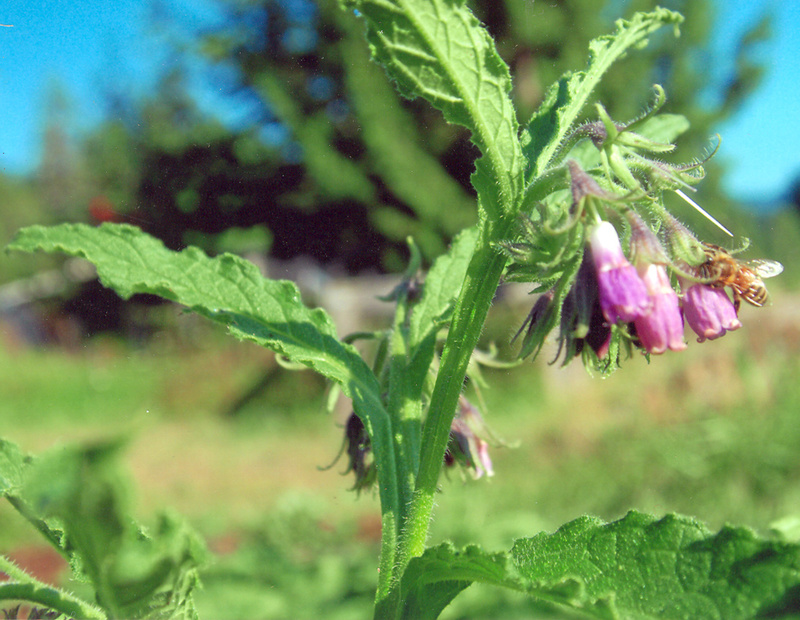 True Comfrey is the original herb as detailed in all the ancient literature. Traditional usage (TWM): used externally to speed healing. Source of alantoin. Plant prefers full sun and regular garden soil. Good drainage is helpful (add sand and organic matter to clayey soil) and frequent watering is also helpful. 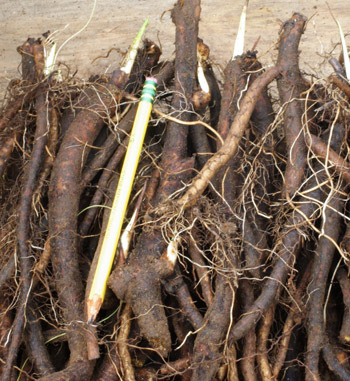 To plant a true comfrey root, find a spot with good sun and rich soil. Plant the root with root down and crown up, burying the crown by at least an inch of soil. Water the spot. The Comfrey will soon send leaves up through the soil surface and… you’re off! After the plant reaches the late flowering stage, simply cut it back and lay the leaves back down on the crown. It will regrow through its own mulch. I received a beautiful, healthy crown this past fall. I planted it in a container and it immediately growing. This spring, it looks spectacular – very happy, once again – you guys rock! 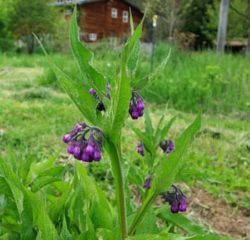 I planted the root of comfrey last fall. I was concerned because it turned cold soon after planting it, but there is new growth coming up quickly now. Thank you very much. 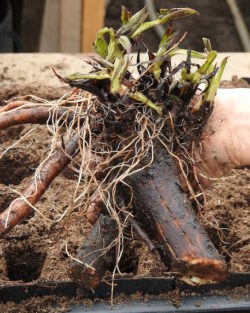 Can you plant comfrey root cuttings now in a Zone 4 location? Any additional mulching requirements so they survive the first winter? Thanks so much! 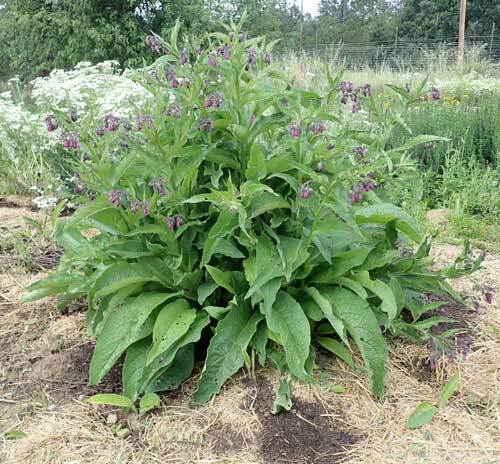 Hello Shannon, Right now up to first frost is a good time to plant comfrey. There is a fall window and a spring window–these are the times transplants work best. As always, make sure the cutting is completely covered with dirt and then apply a thick layer (up to 4 inches) of compost or manure on top of the spot and finish with a thick layer (up to 6 inches) of straw or other non-bark mulch. Normally you see results by way of new leaves poking up through the mulch within 3 weeks. Plant them like that, and they will really produce! I’ve read elsewhere that you should not harvest comfrey until its second year. Would you agree with that, or, if not, what are the signs that you’d look for, to tell you that the plant can withstand harvesting? Thank you. Yes, I think that would be correct, in terms of allowing the plant to size-up before harvest. I think the root and the leaf of 1st year plants are just as good as the root and leaf of second year plants, though, just not as prolific. 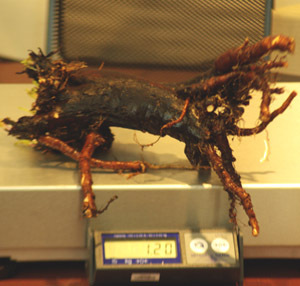 A large crown (6 inches across) is a sign of harvestable roots.